I've used my lovely horse from Horse Frontier again because riding is a sport (isn't it?!) and apparently it's excellent exercise for your derriere and thighs too! I stamped the horse into a mask made with my 2 1/2" circle punch and sponged a sky-ish background. I went a bit mask-tastic and made a mask for the horse too so that I could add a bit of hedge! • There's only one place left for my Stampers 6 club starting in February. Do let me know as soon as possible if you'd like to join in - you'll get a free spring/summer catalogue, the opportunity to earn Sale-a-bration freebies as well as getting at least £25 of free items from the catalogue - all for placing an order of £25 or more for six months! I went through my horsey phase when I was nine or ten but my daughter got the bug quite a bit earlier. She was only two years old when she heard the sound of horses hooves outside and rushed to the window to watch a rider pass by outside. Suddenly she burst into tears and since she was inconsolable for some time I began to worry that she'd hurt herself somehow. Eventually she calmed down and was able to tell me that she wished so very much that she had been on the horse! What a funny, passionate little noodle she was! We got her a little rocking horse shortly after this which she never looked at, but when she got a plastic toy stables play set for Christmas, she played with nothing else for ages! Oh I've done that Vicky, been in such a rush to get started I don't read the brief properly. Glad it's not just me then! Love the hedgerow peeking from behind Dobbin and the lovely font. Keep going my friend - I have this set and a horse-y client (my sister, the equine surgeon), so that more I see of this set, the better. I love what you did with it here - I feel a case coming on! PS - I had the same thought of using a horse for less is more and stumbled on the one layer criteria, too! lol! I just love the horse, like you, this is a great card. One of my neices when younger "borrowed" a horse from a neighbour to ride and then took the horse on as a rider to excercise it, she rode him for at least 8 years. She has now had 2 Spanish horses and is still horse crazy at 50! What a precious card...and love the way you did the masking, sponging technique. That takes a lot more time & effort than plain ole stampin' & colorin'. Yet it stayed nice & soft looking too. I think all little girls must go through a horse phase. Our daughter did, but eventually I think we outgrew it! Thank goodness. Thanks for sharing a lovely card. It's SO easy to get carried away with ideas and forget the one layer bit Vicky, I've done it so many times myself, but this one is just super! 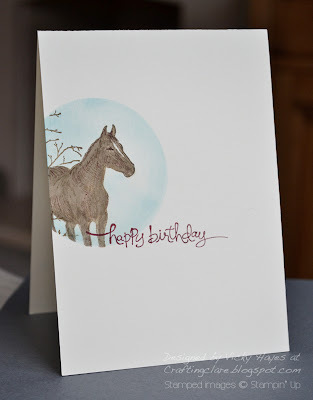 I'm loving all your horse stamps...super card!